Cookie swaps are a relatively new concept to me. While I often baked cookies for family and friends in Texas, I don’t remember anyone ever getting together to swap what we’d baked. Certainly it never happened in England, I think I was one of the few people I knew that baked or cooked from scratch at all. When I saw Julie from The Little Kitchen tweet that they were throwing together a virtual swap, amongst food bloggers, I thought, “How fun!” and immediately signed up. You can sign up for next year now! Now, I don’t know about you, but in the last few years, one of my favorite things about when the holidays roll around is Hershey’s seasonal Candy Cane Kisses. I actually buy up 5 or 6 bags and freeze them, just so I can have my favorite white chocolate + peppermint combination year ’round. I haven’t figured out yet the best way to chop these guys up into chip-sized morsels, though a food processor works pretty well. I’ve also tried it by hand with a knife (tedious) and even with a meat tenderizer (cathartic, but again, tedious). So far, a food processor with a shredding blade works best. Next time I make these guys, I think I’m going to bump up the white chocolate quotient by adding a cup of white chocolate chips, but I’m really pleased with how they turned out. 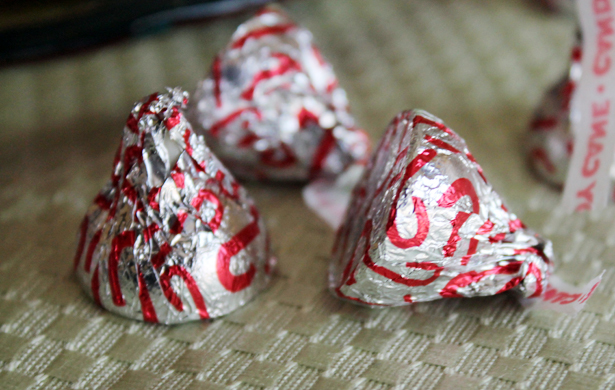 The addition of holiday non pariels mimics the slight crunch in the Candy Cane Kisses. 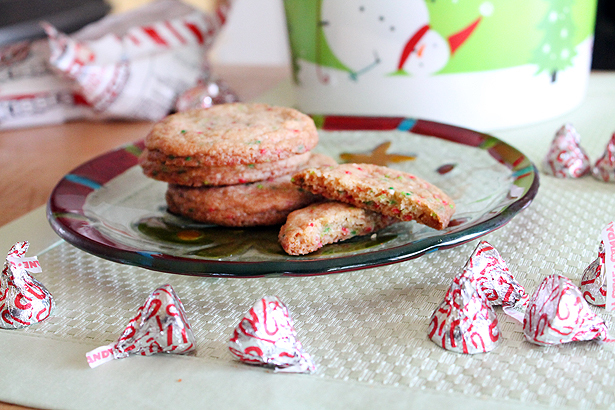 The peppermint flavor from the Kisses combines so well with the vanilla sugar cookie base, it simply makes for a delicious, buttery, minty cookie. So far I have received two batches of cookies, wonderful Snickers Peanut Butter Cookies from Nutmeg Nanny. Next to arrive were beautiful Eggnog Cookies from Hannah. Miss PostLady is hopefully bringing me a surprise from Loy at From Grandma Loy’s Kitchen today. I can’t wait to see what they are! Are you getting excited for the holidays yet?! In a medium bowl, combine flour, baking soda, and kosher salt. Whisk well to combine and aerate the ingredients, then set aside. In a large mixing bowl, combine butter and both sugars. Cream on medium-high speed until light and fluffy. Add vanilla and eggs and mix again until completely combined. Add flour mixture in increments to butter mixture, mixing on low speed after each addition until completely combined. 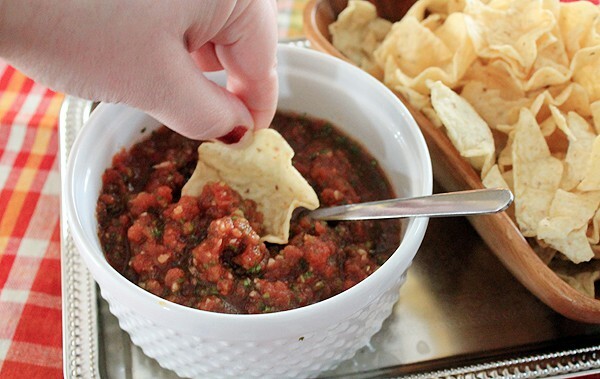 Scrape the sides of the bowl with a spatula often. Add the Candy Cane Kiss pieces and non pariels when flour is completely incorporated. Mix on low until you feel the Candy Cane Kiss bits are well distributed. It is not integral, but I found the dough to be more flavorful when refrigerated for at least 20 minutes. You may also roll the dough into balls and flash freeze them for baking as and when you want. Simply store in a gallon ziptop bag once frozen. Bake at 350F for 15-17 minutes from fresh or 375F for the same amount of time from frozen. Best served with a cup of cocoa and a smile! I made some today and they are awesome…Everyone in the house loves them! Have you tried the Dove Peppermint Bark candies? Omgggg. They’re like the Hershey’s peppermint kisses but with dark chocolate too. SO GOOD. These cookies look seriously delicious. I have this thing about “wasting” seasonal candy on baked goods but if I can get past that, I’m definitely making them! Amanda, I have not! How have I missed those? I usually go for the ghirardelli peppermint bark, which is AMAZING. I bet the holidays are lovely at your place. You’re an excellent hostess on an average day, but when you’re serving up cocoa and these cookies? Top marks. You’re too kind, Aimee. I wish I could have you and all the BSP girls over this Christmas. How fun would that be? How fun! I wanted to join in on the cookie swap, but had too much going on this year. These cookies look lovely though; I have no doubt the lucky recipient of your cookies was absolutely thrilled! Aww thanks, Tracy. Next year! The power of Twitter is amazing, Julie. I’m so glad we’re friends! You are torturing me. I have all these chocolate mint thumbprint cookies in the house but now I want THESE too! If I had extra, I would totally bring you some! I’m going to have to try these. I love candy cane kisses! All I can say is, Make These Cookies! They are delicious. Thanks again, Amber. I hope the postal lady brings your cookies soon. Thanks for the warning about the creme de menthe kisses. I was going to try them in my Hidden Kiss Cookies. Maybe I will skip that now. The cherry kisses worked very well, however. Thanks, Tara! I took these to the cookie swap at Hill Country too. I think they went pretty fast. How cute! I wondered what I could make with those kisses. Thanks, Erin! I wish I still had some left. I’d eat one for breakfast. These look delicious! I love the colors in them. Love this idea!! Those kisses are one of my favorites too. Thanks, Kristan! I know they’re not nearly as creative as what you would do – Hello Marshmallow Snowmen – but they sure are tasty.